This is a special Sunday when we turn our focus to the ancient Christian ritual of dedication. Throughout history, this practice of setting persons, places or articles apart for sacred use has been an important part of living faithfully. It is the act of acknowledging that the greatest gifts in our lives come from God , and that causes us to live with greater thanks… Today we celebrate the gift that has been Karen Hunnie, a wife, mother, grandmother, faithful Christian, energetic worker, tireless walker and our friend. In her honour and to her memory we will dedicate a new window that will remind us always of God’s creative work within this community of faith. Karen Hunnie was a tiny dynamo. Whether she was walking, running or cycling….she was always on the move. Karen worked hard at everything she did. She did not waste energy on worry or inaction…she saw what needed to be done and she did it. Even after her diagnosis last year, I offered to walk with her thinking that she’d tire after a block or two. Boy, was I wrong!!! Off we went at breakneck speed around Windsor Park. She approached all of life this way. Her family, Don, Connie, Mark, Carson, Sheri, Dave, Jacob and Madison have been blessed beyond measure by her love and courage and zest for life. We are grateful to Don and his family for their generosity in making this gift to Windsor Park United Church. We are honoured to be entrusted to this memorial to Karen. We set apart and dedicate this window in this holy place, as it fills this space with light and dances with colour, as its pictures stimulate our minds to thankfulness, as its beauty reminds us of the wonder of Creation, may your glory be known to all we see it. 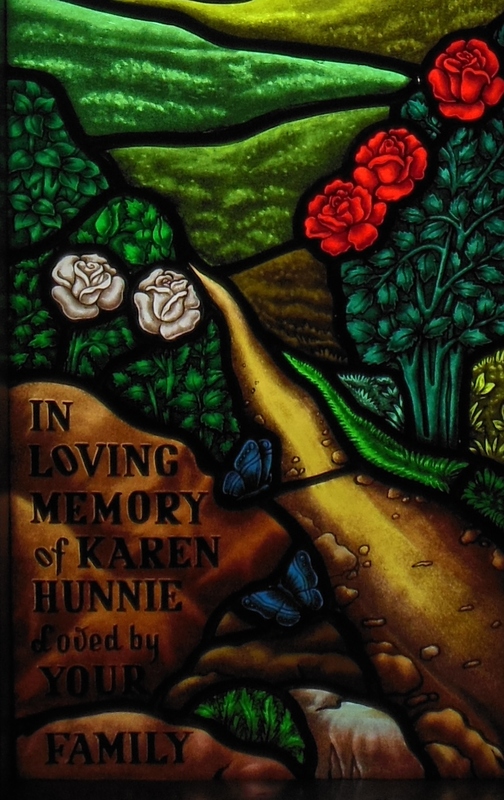 Now in the name of the Father and of the Son and the Holy Spirit I dedicate this window in loving memory of Karen Hunnie. Let all God’s people say…Amen. Gentle God, you always walk with us….even when we don’t notice. Your presence is a source of strength when we feel weak and clarity when we are confused. You manage to work your miracles in the most ordinary aspects of everyday living and for that, we thank you. We are so grateful for all our memories of Karen and for the legacy she leaves to our congregation—her’s was a steady, deep and sure faith—and if we aspire to even a portion of that for ourselves, our lives will be infinitely richer. Allow this window to be an inspiration and not merely a decoration. It calls us to service, wisdom and a boundless faith…..but most of all it urges us to a tenacity of spirit that seeks always to squeeze the most from the blessings of this life. Grant us grace fuelled by joyful memories and expansive dreams. We pray in Christ’s name in the words he gave us, Our Father….